Post 14 of a series detailing our Australian adventure. Access the full series here. Steve and I woke up in our spaceship campervan, in a campsite in Coffs Harbour. 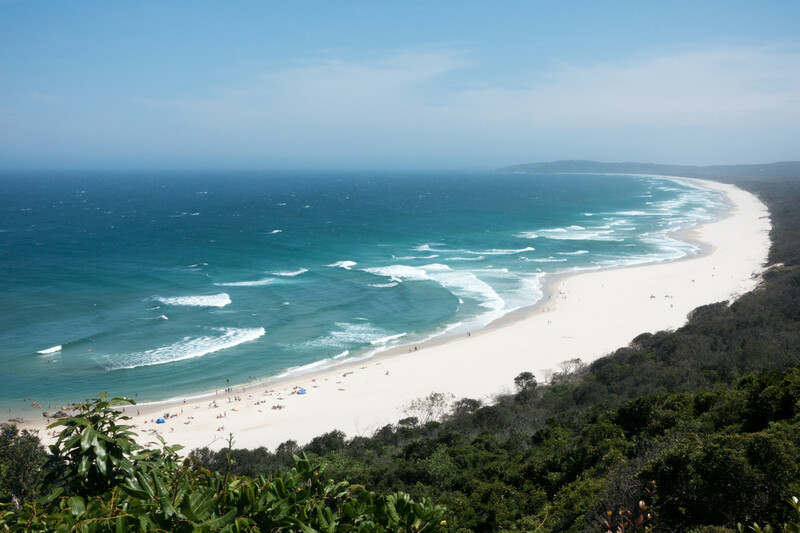 Later we’d be continuing our journey up Australia’s East Coast by driving up to Byron Bay and beyond to Surfer’s Paradise on the Gold Coast. But first we had an exciting date with a couple of slippery characters. 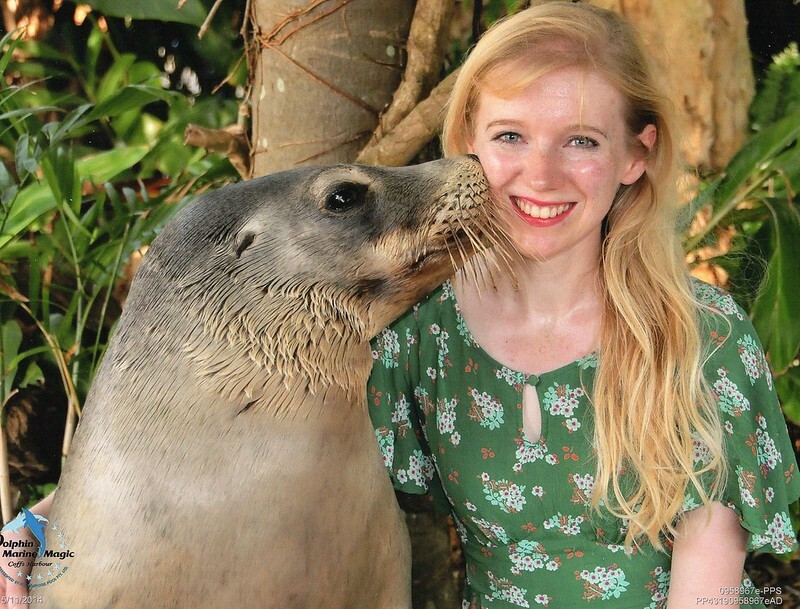 Dolphin Marine Magic, just down the road from our Coffs Harbour campsite, is a rescue and rehabilitation centre for native marine animals. It may sound sleazy, but what attracted us there was the opportunity to get ‘kisses’ from the dolphins and sealions that live there. We got there nice and early, which wasn’t hard since it required just a couple of minutes’ drive from the campsite. Minutes after parking in the car park we were inside and standing by the display pool, our hands hovering over the water. 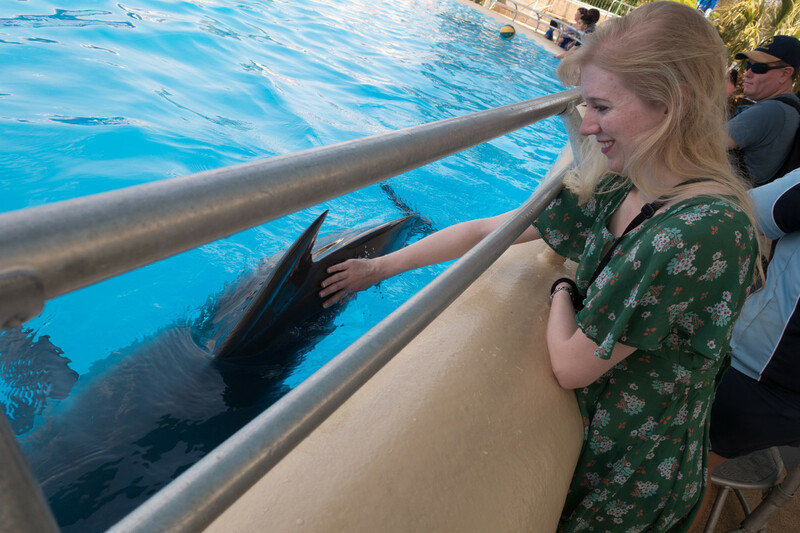 The friendly attendant had told us that if we held our hands flat just above the water’s surface, the dolphins – currently splashing around in the pool – would come to greet us. And to our delight, they did! Within seconds the beautiful grey creatures came rushing around the edge of the pool to slide underneath our hands, seemingly enjoying our touch as much as we enjoyed theirs. I’ve never felt anything silkier. We were then asked to join the queue to get a dolphin kiss. We were the tallest kids in line by a large margin. We decided to get our photos together, one where Steve was being kissed and one where I was. We sat in front of the pool, leaned over, smiled for the camera and then – click! – the dolphin bobbed its head out of the water and pressed its smooth firm nose to my cheek, as the photographer’s flash went off. An unusual kiss but a nice one nonetheless! 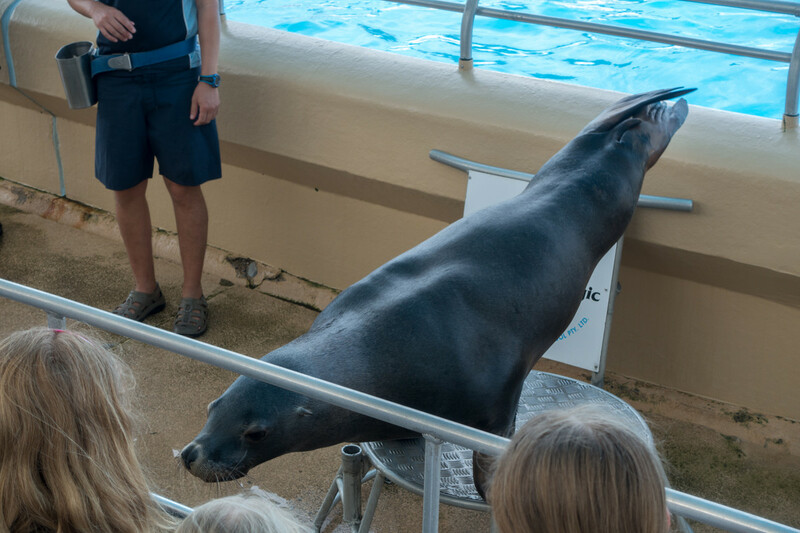 We then lined up to do the same with the sealion, whose nose felt significantly more wet and whiskery. Afterward followed the Marine Magic presentation, which was fantastic. 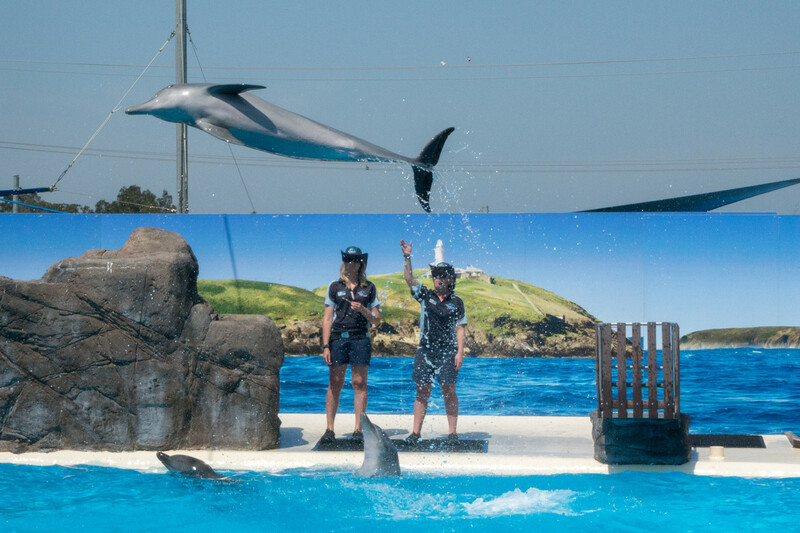 The dolphins demonstrated amazing talent in jumping and twisting around in the air, and seemed to be enjoying it. 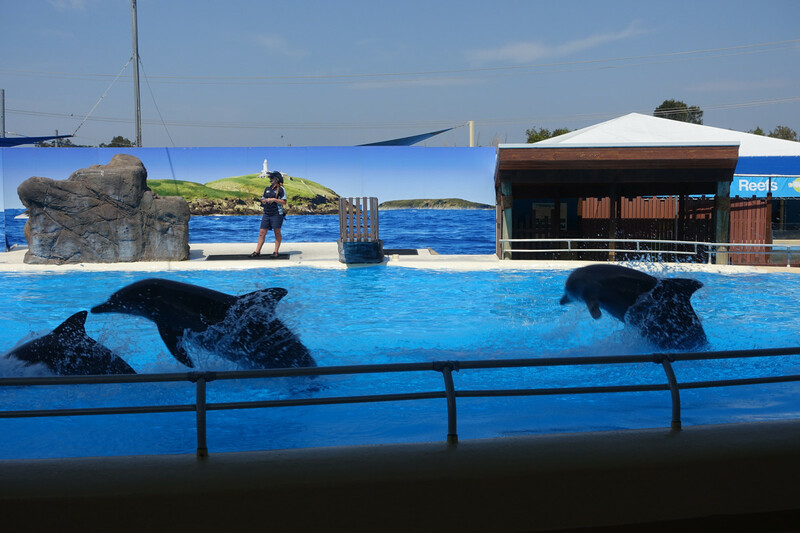 In addition to tricks there was a lot of humour, with the dolphins nodding and shaking their heads perfectly in sync with the presenter’s jokes. 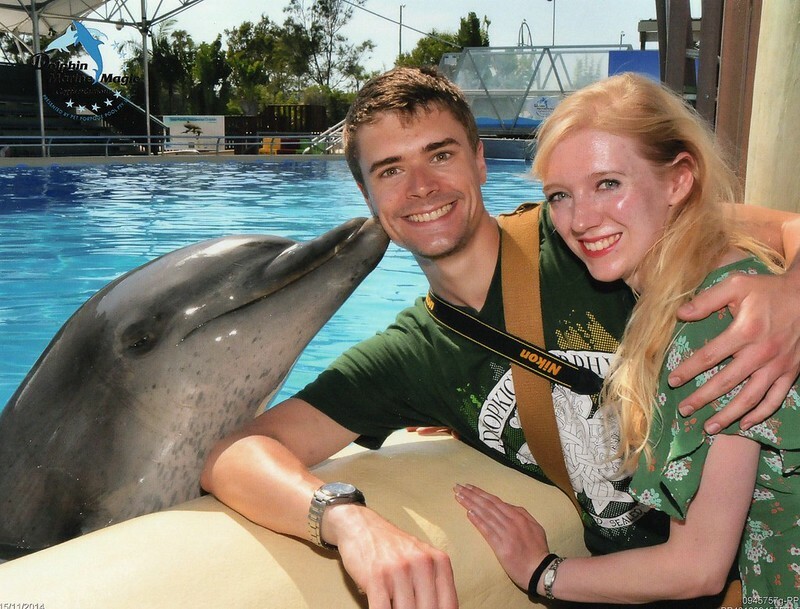 Members of the audience were brought out to ‘clean the dolphin’s teeth’ and hold up fishes for the dolphins to jump and grab – Steve volunteered for this and got very wet! The sealions also performed a host of tricks just in front of the audience, including impressive handstands and ball-balancing. When the show finished, we bought our photos and explored the park a bit more before heading back outside. It was already scorchingly hot by this point, so we found temporary relief in Maxibon ice creams eaten in the shade outside. 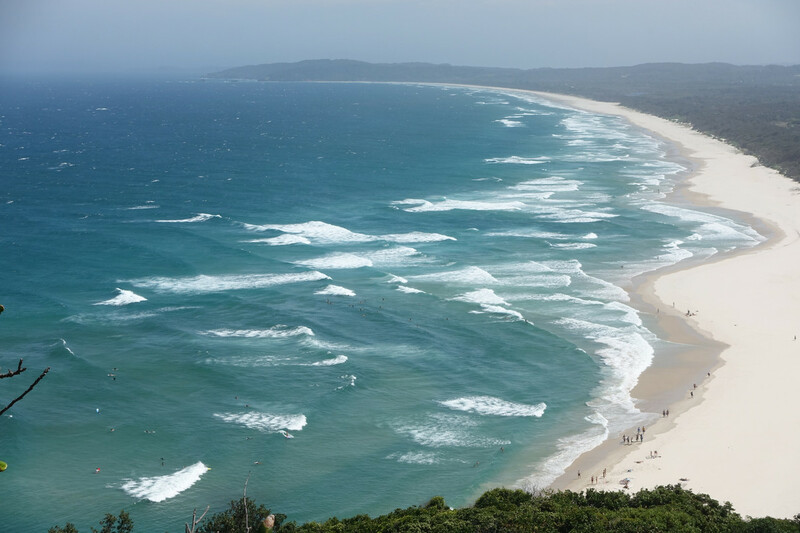 With no more time to lose, we got back in the car to drive to Byron Bay. 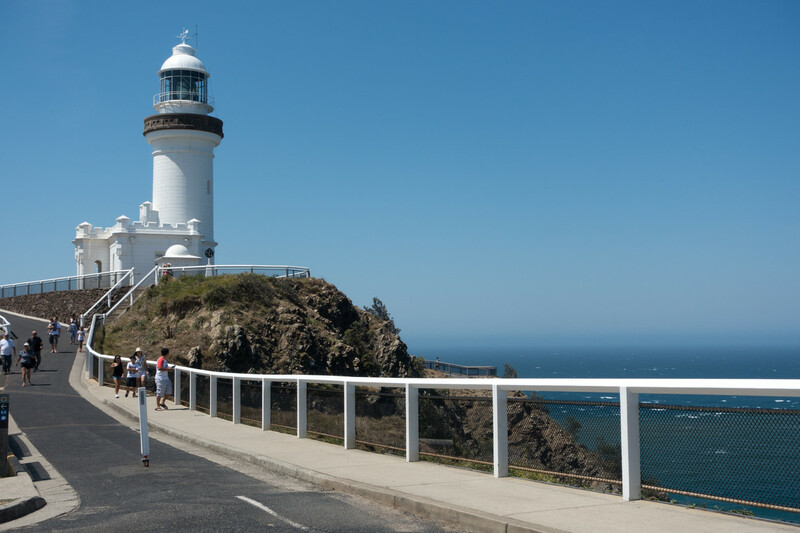 Our first port of call once in Byron Bay was Cape Byron Lighthouse – partly because it was much better signposted than the beaches, which we admired from the windows of our campervan but weren’t sure how to get to. We followed the signposts up a narrow twisting road and soon reached the lighthouse, albeit behind a queue of other cars. Here we were approached by two people: a parking attendant telling us the (paid) car park was full, and a Red Bull promoter offering us free cans! 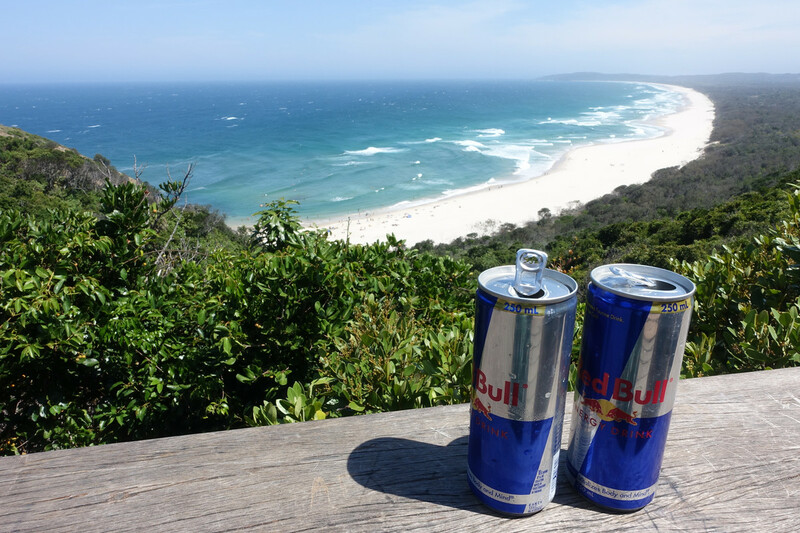 We took the cans, turned the car back around and immediately found a free parking space in a small clearing further down the road – is that what’s meant by “Red Bull gives you wings”? Walking to the lighthouse we enjoyed spectacular views across the long, curving beach and forest below. The lighthouse itself looked extremely picturesque on its rugged clifftop stand, its pure white facade contrasting sharply against the rough black rocks below. We circled the tower, taking in the views and fresh sea air, before filling our water bottles and returning to the car. It was long past lunchtime now, so we drove to the car park for the main beach (certainly not the prettiest, but the only one for which we could find parking) and went in search of food. 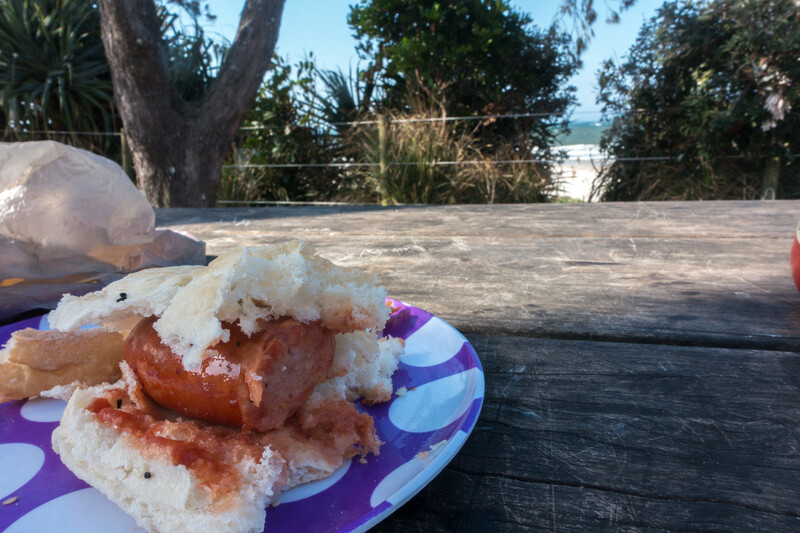 Keen to cook something ourselves and eat it by the beach, we bought some sausages, bread rolls and condiments from a grocery store with which to make hot dogs. Our original plan to cook and eat them at the campervan failed – the strong breeze kept blowing out the flames – so instead we found a picnic bench shielded by some trees and had our little picnic there. It wasn’t quite the ‘barbecue on the beach’ we’d imagined but nevertheless filled the gap. Before leaving Byron Bay, we returned to the grocery store and bought supplies for tonight’s dinner – multi-coloured pasta (hey, we were feeling adventurous! ), a red wine and herb sauce, cider and beer – and a Magnum for myself. Two ice creams in one day is fine if you’re on holiday, right? The drive up to Surfer’s Paradise took several hours and, once we were there, finding the campsite I’d booked there seemed to take even longer! Once parked up, we did our usual walkaround of the campsite and set up the campervan to cook dinner. Thankfully, this was a much more relaxed affair than lunch had been. Steve cooked the pasta by the light of the skyscrapers towering above and we ate it squeezed into the back of our campervan, truly as snug as bugs in a rug. 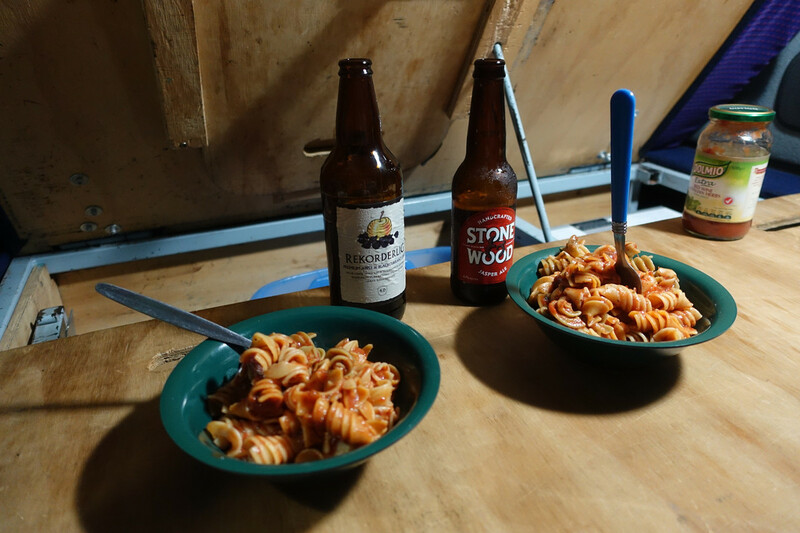 For its extreme cosiness alone, this simple dinner – eaten in cramped conditions under a dim LED light – was actually one of the most enjoyable meals of our trip! All text and photos (c) Juliet Langton, 2015. All rights reserved. 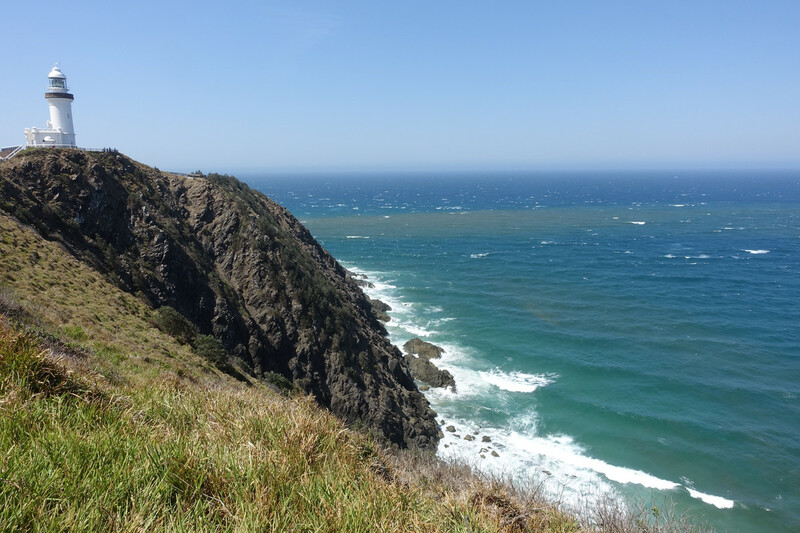 Posted in Australia, Photography, TravelTagged Byron Bay, Cape Byron, Coffs Harbour, dolphins, Featured, lighthouse, Marine Magic, sealionsBookmark the permalink. Aww, what a great read. The dolphins are so clever – I wonder how they are taught to do all those tricks? 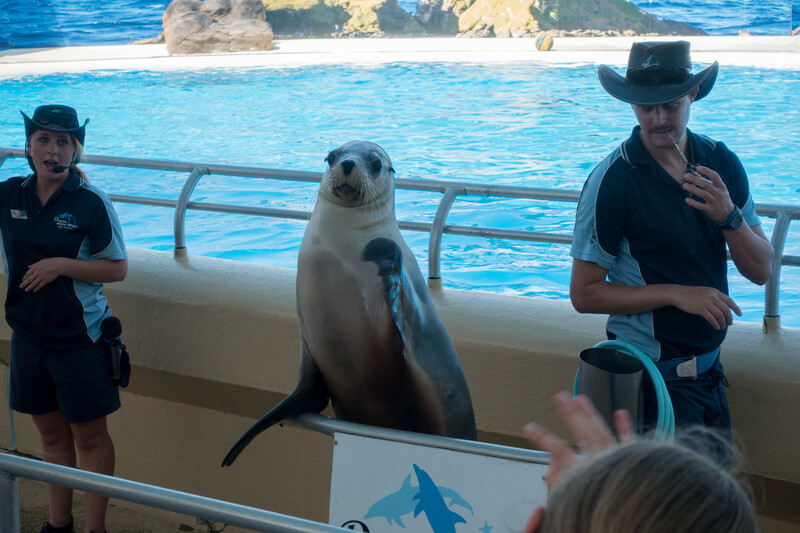 I especially like the sea lion picture and you looking so happy! The beach is amazing – the sea so blue and the sand so white! It was nice – more soft and damp! !